Havana Silk Dog Association of America – Learn about Havana Silk Dogs and Our Breed Club! Welcome to the website of the Havana Silk Dog Association of America, the National Parent Club of the Havana Silk Dog breed. We’re a group of breeders and owners who all agree that Cuba managed to develop a terrific little dog — with a very flat and silky coat, straight legs, healthy, and totally charming —over the last 300 years, and we are totally committed to protecting and preserving this rare breed in its original Cuban form— wherever the winds of fate may have caused it to land over the years. If you would like to read the complete history of this breed and how it became the beautiful dog it is today, click on the Breed History page. If you would like to learn more about the history of the HSDAA, click on The Journey. All members of HSDAA receive a print and online subscription to the Silk Road, our beautiful, full color breed magazine. If you are searching for the best dog you will ever own, (or who will ever own you), then you have come to the right place. The Havana Silk Dog is truly a “big” dog in a “small” dog’s body. They are extremely smart, very playful, quite loveable, and excel in athletic competition sports and obedience trials. They are small enough to be portable, and sturdy enough to not be fragile. They make good watch dogs but they are not yappy. They can be very affectionate, but they are not needy. They are usually happy just to be hanging out in the same room with you. They love everyone, from children to adults to the elderly. They even love the other animals they “own”, other dogs as well as cats. They have wonderful, calm temperaments and are gentle natured. They do not shed and are “hypo allergenic”. If this describes your perfect dog, then the Havana Silk Dog is the one for you! Silks perform wonderfully at agility and seem to love competing. Hair flying, they are a thing of beauty to observe running an agility course. This is a great way to exercise your Silk as well as yourself and meet other “dog people” at Agility events. Silks always enjoy socializing as well. We always recommend that your Silk puppy accompanies you to Beginning Obedience classes, but these Silks just love pleasing their favorite person so much, that they compete and win awards in both Obedience Trials and Rally-O (Rally Obedience) trials. This is another great activity for you and your Silk to participate in together. Your reward is that you end up with a really attentive and obedient companion. If you think you might enjoy showing your dog in a dog show, but don’t want to be a breeder, then the HSDAA is the place for you. If you choose to spay/neuter your Havana Silk Dog, you can still show your pet in the Companion Class and let your Silk dog strut his stuff! The HSDAA is one of very few purebred dog clubs that allows Companion dogs to be shown. The Companion dogs are shown in their own Class with other Companion dogs, are scored by the same judges, with the same scoring and evaluation method, and are awarded the same prizes as those dogs in the Certified Class. You can be mentored by your own breeder or any other member who knows the ins and outs of dog showing. It is not cut-throat or political, but a nice relaxed atmosphere. Everyone has a good time, including the dogs! If your children or grandchildren or even your nieces or nephews would like to be a part of the dog show world, the HSDAA also have a venue for them. It’s called Rising Stars and we have a Page on this website just for this group. All the ins and outs of this special category for showing are explained there. For more information about the protocol for showing your Silk in the HSDAA shows, please visit the Showing Your Silk Page. And if you are a real “dog show” person, who just can’t get enough of being in that show ring, you can also show your Silk in ICE(International Canine Events). 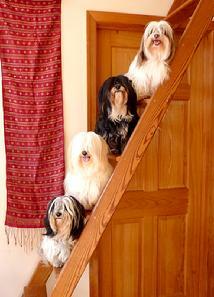 This is an All Breed Club that includes Rare Breeds and welcomes the Havana Silk Dog. http://icedogshows.com/. For more information go to the ICE site and you can locate a Dog show near you. We pair up with ICE to offer opportunities to earn HSDAA points/titles as well as ICE titles at the same shows. Many Silks are Certified Therapy Dogs. They visit libraries for children’s reading programs, are utilized at home to assist autistic children or persons with handicaps, and visit nursing home residents and hospital patients in order to provide companionship and comfort. The calm and gentle nature of the Havana Silk Dog makes it well suited to perform therapy duties for children or the elderly. Silks are always up for a good time. Whether its rafting, kayaking, sailing, camping, outdoor dining, or going to the kids’ ballgames, your Silk can be a part of the fun. They are highly social and love to be included in family activities and not left home alone. Every creature they meet is a friend and they love both the four-legged and the two-legged varieties. We invite you to look around our website and learn all that you can about these enchanting little dogs of Cuba. We believe that a great puppy owner is an informed puppy buyer. Check out our upcoming dog shows or the Local Silk Clubs and come visit with Silk breeders and owners. Experience the beauty, the softness and silkiness, and just plain fun of the Havana Silk Dog. You’ll fall in love—Guaranteed!